Need to make some extra money for your family, but can’t leave your kids alone at home? Consider Kaeser & Blair’s stay at home mom jobs. By selling promotional products, stay at home moms are able to run their own businesses and receive generous earning potential. The way to get started with one of our stay at home mom jobs is simple. For a minimal start-up cost of $85, you are granted the title “Business Owner” and given a Standard Business Owner Package. In the package, you’ll find all the tools necessary for our stay at home mom jobs, including a Business Owner Reference Manual. This manual provides useful tips on how to sell products, promote your business, and place orders. Reading the manual will be a great first step to turning one of our stay at home mom jobs into a success. Once you’ve reached $1,500 in sales, we’ll refund you the minimal start-up cost making Kaeser & Blair a risk-free opportunity for anyone looking for stay at home mom jobs. As a business owner, you’ll be to make our stay at home mom jobs your own. In fact, Kaeser & Blair’s stay at home mom jobs don’t require you to sign a binding contract. You’ll be able to do anything you’d like with your business including set your own schedule—an incredibly important aspect of stay at home mom jobs. Work whenever and wherever you want when you work with Kaeser & Blair. Our stay at home mom jobs provide an opportunity that allows you to watch your kids and make money. Part-time business owners can earn an income as much as $20,000 yearly in our stay at home mom jobs. That’s more than enough to help your family afford a nice trip to the beach. Our generous earning potential is one of the highest in the industry with profit potential 65% of gross margins. You’ll also receive your profits extremely fast, as the money is direct deposited into your checking or savings account upon order entry. Our stay at home mom jobs are an incredible way to make money fast! Naturally, the more you work then the more you’ll earn, so a motivated, entrepreneurial spirit will certainly find great success in our stay at home mom jobs. 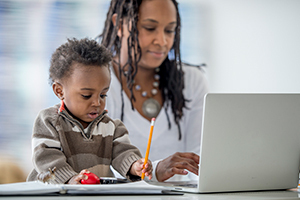 Turn one of our stay at home mom jobs into a career and you could earn an annual amount up to $185,000. The choice is yours! Now it’s time to choose whether or not you will take advantage of the incredible opportunity shown through our stay at home mom jobs. Are you ready to gain financial freedom through our flexible work opportunity? Request our FREE TRIAL LAUNCH PACKAGE today! Want to skip the trial and move straight to the Standard Business Owner Package? Order it here.